There’s no question that the ROI from email marketing efforts surpasses that of social media — but when they work together, you could see your click-through rates rise up to 158% and your social following grow significantly. Even the most basic integrations, like including social icons in your emails, can result in more than a 24% increase in reach. Yet, only less than half of marketers encourage social sharing of their emails … and the rest are missing out on some big benefits. Not sure where to start? 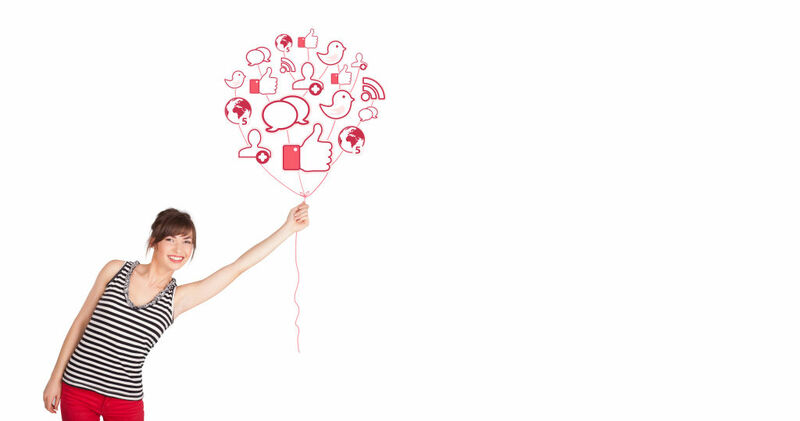 Here are three ways you can integrate social media and email to better connect with your customers — and amplify your marketing magic. Pull in live social feeds. Visual content is always a winner in email, and incorporating fresh social images and messages from your fans let’s them get the word out for you in a compelling and authentic way. 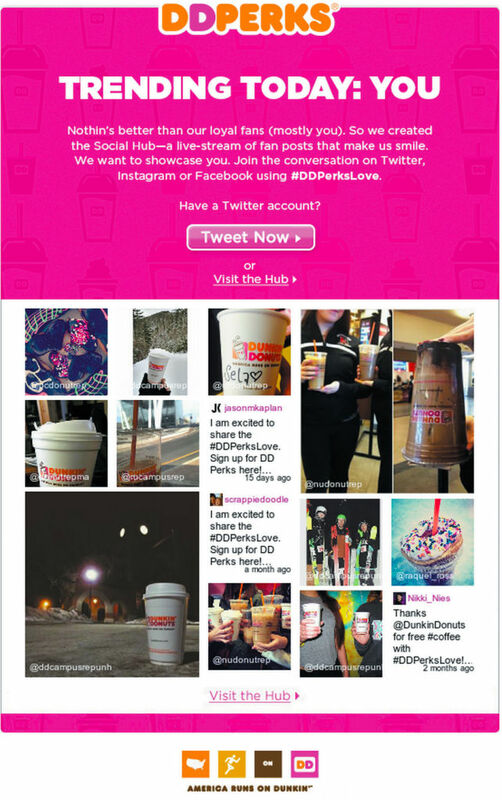 Dunkin’ Donuts “Trending Today: You” campaign relied heavily on visuals to promote their new Social Hub, a live stream of content pulled from fans’ Twitter, Facebook and Instagram accounts. Not only did this point readers to Dunkin’ Donuts’ social channels, it acknowledged customers as a vital part of the brand’s identity. Invite people in. Dedicate an email campaign to social with a single, simple CTA: follow us. Providing a solid reason—like be-the-first-to-know deals or discounts exclusive to social followers—will incentivize readers to act. Just look at the results that retailer UncommonGoods got after sending emails dedicated to a Pinterest contest: a 200% increase in audience growth and a 66% rise in their email click-through rate from the previous year. Conversely, prompting followers on social media to sign up for your emails is also effective. A recent study showed that only 50% of a company’s social media followers are on the company’s mailing list. After KFC addressed this issue by adding a sign-up widget to their Facebook page, the company saw email opt-ins rise by 30%. In addition to this social-dedicated email campaign, make sure your welcome emails include a call to follow your brand on social. Create a hashtag. Twitter has revolutionized how people around the world communicate with each other, so why not leverage that power in your email campaigns? Whether it’s a hashtag you want to associate with your brand in the long term (like KitKats #HaveABreak) or one connected to a particular campaign (like Travelocity’s #iWannaGo), creating a unique hashtag and promoting it through email can raise brand awareness, advocacy and customer loyalty—not to mention cultivate new leads—across various social channels. American Eagle Outfitters actually used their campaign hashtag, #LiveYourLife, in the subject line of their emails, immediately appealing to active Twitter users. A four-month study by Experian backs up the tactic, which saw hashtags generate a 4.8% increase in open rates,. This can also drive customers to act without ever having to open the email. Once your campaign sees action on Twitter, incorporate a live social feed into your follow-up emails. This shows readers that other customers are actively participating and encourages others to do the same. Bonus: once the campaign has ended, upload your new email subscribers to your social media networks and invite them to follow. Need a little more social + email inspiration? Read on. This entry was posted in Email Marketing on January 13, 2016 by Amy Mullen.